Intel Corp. (NASDAQ: INTC) lost share in worldwide total microprocessor revenue in the first quarter of 2009, ending a year of sequential market gains, according to market research firm iSuppli Corp. On the other hand, Advanced Micro Devices Inc. (NYSE: AMD) gained market share in the first quarter at the expense of larger rival for the first time in a year. Intel saw its share of the market decline 2.5 points to 79.1 percent, iSuppli said. It was Intel's first loss of share following four consecutive quarters of market share gain, according to the market research firm. AMD's share of the global microprocessor market grew to 12.8 percent in the first quarter, up from 10.5 percent in the fourth quarter of 2008, iSuppli said. AMD's share of the microprocessor market nearly equaled the 12.9 percent it held in the first quarter of 2008, iSuppli (El Segundo, Calif.) said. "Intel widened its lead in 2008 partly due to its Atom microprocessor, which has achieved major success in the fast-growing netbook PC market," said Matthew Wilkins, iSuppli's principal analyst for compute platforms research, in a statement.. He added that the strength of the company's entire product line—including microprocessors for desktops, servers and notebooks—was the major factor driving its success. Intel's market share decline in the first quarter was as a result of the contraction in the PC and server markets, where end-application demand is suffering from the credit crisis, according to iSuppli. "AMD increased its allocation of global microprocessor revenue due to strong performances in each area of its microprocessor portfolio, particularly in its notebook products," said Wilkins. "This was an impressive feat given the economic downturn and the weakness in the PC and server markets, which caused global microprocessor revenue in the first quarter to decline by 20.6 percent to $6.9 billion, down from $8.6 billion during the same period in 2008," Wilkins said. 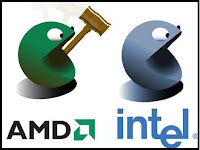 Both AMD and Intel suffered first quarter revenue declines due to the poor economic and market conditions, iSuppli noted. Those factors are expected to continue to hamper the global microprocessor business in 2009, with full-year revenue set to $28.6 billion, down 15.8 percent from $34 billion in 2008, the firm said. After declining slightly in the fourth quarter of 2007 to 78 percent, Intel gained share throughout 2008, with its portion of microprocessor revenue rising to 81.6 percent in the fourth quarter, according to iSuppli. The firm's microprocessor market share statistics consider all types of microprocessors, including x86, RISC and other types of general-purpose devices.